Paul was so touched by the story of Private William Norris that on one of the foulest wettest days of the year, he took a bus across south London to the spot outside the former Tooting Gin Palace to pay a quiet personal tribute to the Summerstown soldier who was killed by a tram on this spot, almost 99 years ago. We intended to film him reading a few lines of verse but the roar of buses, builders trucks and Garratt Lane Friday afternoon mania drowned out the sound. A fine gesture Paul, may the spirit of the Summerstown 182 be with you. The death of each of these men was a tragedy but if there is one location where a more intense level of grief was suffered than any other, it must surely be at the north end of Thurso Street. This road runs south off Smallwood Road, not far from the school and the houses at this junction are the same as they would have been in 1914. Its a short walk from Tooting Broadway and close to St George’s Hospital in an area once known as Fairlight, which a hundred years ago was a place of great deprivation. The school was at one stage a Sunday soup kitchen for poor local children. Now I’ve noticed estate agents call it the Tooting Triangle and houses cost close to half a million pounds. Its a road that had great sadness visited upon it. At Number 8 lived Winifred Seager, a widow and her seven children. She was to lose three sons in the war, one in successive years between 1915 and 1917. Just two doors away at Number 12 was the Tibbenham home. Two brothers from this household of nine children were also to perish. A little further along at Number 2, two Mace brothers would be killed and if that wasn’t quite enough, on the other side of the street, Private Charles Jeffries at Number 13 also died of his injuries in the war. Other streets like Hazelhurst and Maskell Road were harder hit, but the effect of the concentrated carnage in this particular corner is hard to comprehend. Private Albert Henry Seager of the East Surrey Regiment died on 20th November 1915 and is buried in nearby Streatham Cemetery. He worked as a printer’s assistant and was 22 years old. Able Seaman Ernest John Seager, aged 24 was drowned on HMS Shark in the Battle of Jutland, 31st May 1916. Lance Corporal Edward Seager of the Royal Fusiliers was killed in the Battle of Arras in the attack at Monchy-le-Preux on 10th April 1917. He was 28 years old and worked as a clerk at the Stock Exchange. We have only been able to find records of two of the Tibbenhams. Sergeant Spencer Tibbenham aged 28, serving in the Australian infantry was killed on 30th May 1917 at Ballieul. Exactly six months later Private Eric George Tibbenham of the East Surrey Regiment was killed on 30th November 1917 in the battle of Cambrai. His Commonwealth War Graves Commission (CWGC) record suggests he was 20, the census indicates he was only 17. A third person with this name, ‘H Tibbenham’ is on the War Memorial but we have been so far unable to find out who this is. Spencer Tibbenham was a draper in 1911, his brother of course was still at school. 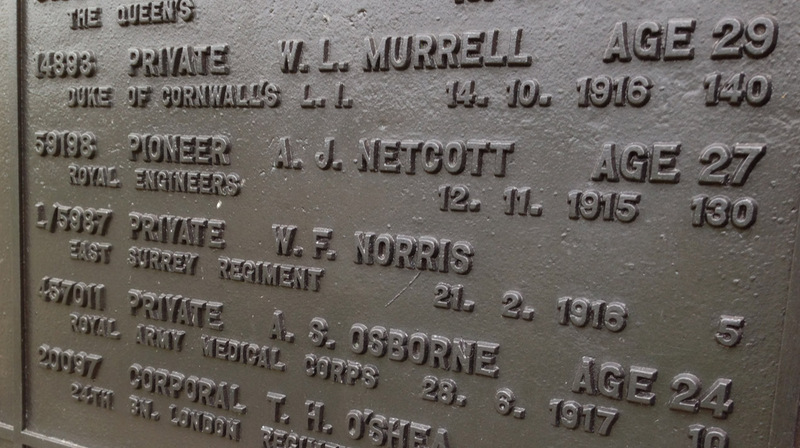 We have also been unable to locate a CWGC record for the two Maces. The St Mary’s church parish magazine tells us that Arthur James Mullinger Mace of the Welsh Horse Yeomanry died in hospital on 1st October 1918 aged 26. He is buried locally and we will try to find out where. In the 1911 census the Maces were living at 2 Thurso Street with their step-family, the Smiths. Thirteen people in a tiny two-up, two-down house. We also have no details of his younger brother William Henry Mullinger Mace. At Number 13, Charles William Jeffries of the Royal Engineers died on 13th November 1917. His final resting place is also in Streatham Cemetery. Nine young men on one small stretch of road, Thurso Street, London SW17. 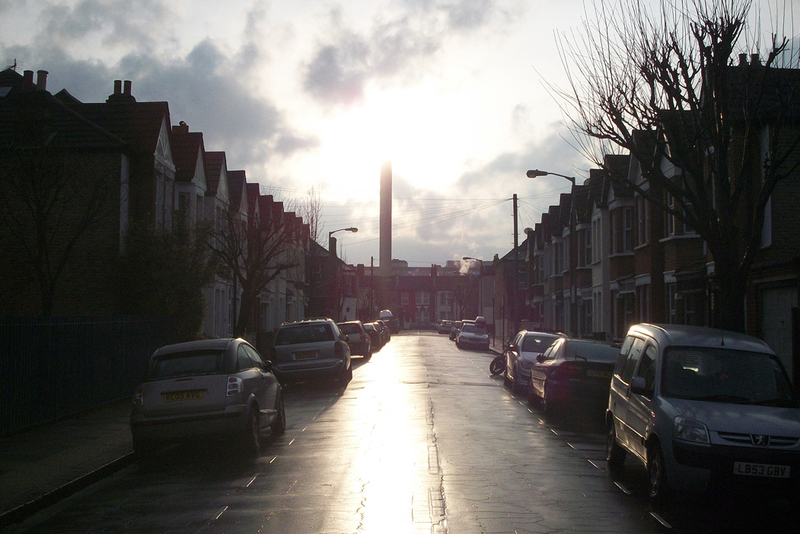 There is a very tall chimney-stack close to the end of the road, something to do with the hospital. Whenever I look at it now, it appears to stand to me as a memorial to the Summerstown 182 of Thurso Street. Wandsworth Cemetery is a long rectangular graveyard which slopes gently down into the Wandle valley, flanked by Magdalene Road on one side and the railway line on the other. 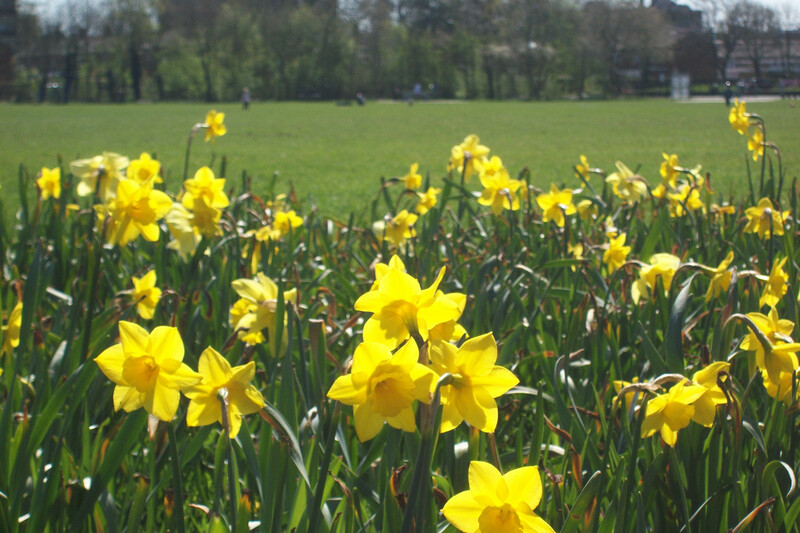 Its high point is close to the big expensive town-houses on the edge of Wandsworth Common and it drops to the back of Earlsfield Station. Tens of thousands of commuters, in and out of Waterloo, pass by it every day and lost in their Metros and tablets, probably hardly give it a thought. In one of those big houses, in what is known as the ‘Toast Rack’, just across Trinity Road, once lived David Lloyd George. He became Prime Minister of Britain’s war-time coalition government in 1916. Its ironic that only a brisk twenty minute walk downhill separated him from 182 of his foot-soldiers. 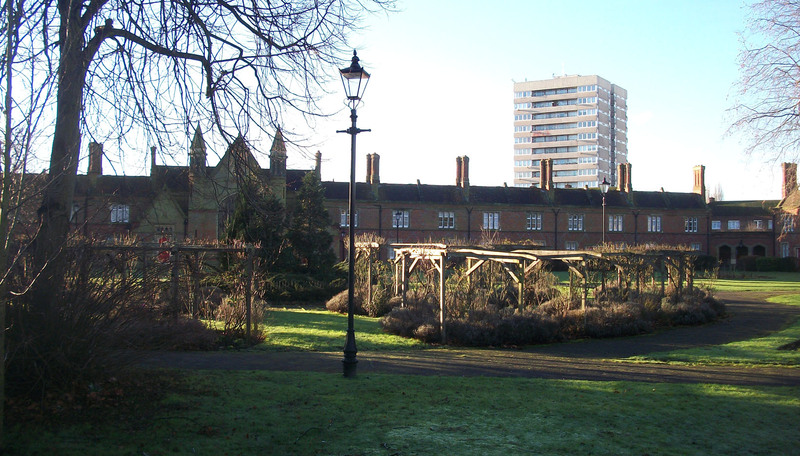 Summerstown nestles between two areas of high ground, the Commons of Wimbledon and Wandsworth. In the valley, the ancient Garratt Lane follows the course of the river all the way from Wandsworth to Tooting. This cemetery is the final resting place of ten of the Summerstown 182, the largest single collection of them in one place. George Batson, Frank Brown, James Coffield, George Cooper, Charles Harwood, Thomas Knight, William Marshall, William Norris, Arnold Smith and Henry Ward. Many would very likely have died in the nearby Royal Victoria Patriotic Building. This creepy gothic chateau, which you can see half-hidden in the trees on the train journey between Clapham Junction and Earlsfield was built as a home for those orphaned by the Crimean War and Queen Victoria laid the foundation stone in 1857. In 1914 it was requisitioned by the War Office and became known as the Third London General Hospital, catering for up to 1,800 patients, in the building itself and tents erected in the grounds behind it. Being next to the railway line was useful and a special platform was constructed so the grim cargo of sick and wounded from France could be off-loaded directly from Waterloo. Think about that on the 08:11 from Strawberry Hill the next time you pass through on your daily commute. Also at that time, a sculptor called Francis Derwent Wood famously pioneered his work on facial masks here, aiding those who had suffered appalling facial disfigurement. Another resident of the cemetery is Lieutenant Henry Angliss of the Royal Inniskilling Fusiliers. He was one of 13 British ‘intelligence officers’ killed in Dublin on 21st November 1920 on the orders of Michael Collins. The retaliation at Croke Park that afternoon, in which another 14 people died, lead to this being known as ‘Bloody Sunday’. Not all the Summerstown 182 died in a trench or on a foreign battlefield. One perished less than half a mile away from his home. The story of William Norris is so sad that I was almost afraid to tell it. But its been told before and although it is so tragic, it highlights another overlooked aspect of the war and the unforeseen consequences of this unprecedented period of great upheaval and uncertainty. The details of his story are in the South Western Star newspaper, March 3rd 1916, under the headline ‘Forsaken soldier’s despairing act’. It tells how William Frederick Norris, aged 39 0f the East Surrey Regiment, home on sick leave, threw himself under a tram in Garratt Lane. He was killed instantly. At the Coroner’s Inquest, his Mother told how his wife of five years had left him some months earlier. She also reported that he had made a will shortly before his death. William had been wounded at the front and was due to return to his base in Dover. He left his home at 47 Summerstown on the evening of Monday 21st February and set off down Wimbledon Road, refusing his Mother’s offer to pay for a tram ride. A little bit further down Garratt Lane he went into the Fountain public house. This no longer exists, it was just a bit past Deepak on the other side of the road (the red hoarding to the left of the above photo marks the spot). Here he was engaged in conversation by a veteran soldier who recognised his Boer War ribbon and asked him if the guns in France were different from those used in South Africa. The reply was that they were all alike. The man noticed that he wasn’t drinking. At 930pm, another witness saw William coming out of the pub. He took off his hat and loosened his belt before running in front of a tram which was heading towards Wandsworth. The jury found that there was no negligence on the part of the driver and concluded that William’s act was intentional. Who could walk this stretch of Garratt Lane again and not think of the fate of poor William Norris? A lot of housing is springing up in this area, the Deepak site is undergoing development and they have temporarily relocated next to the Leisure Centre. The Fountain, which was for a while the infamous Tooting Gin Palace, was demolished about five years ago and is now a block of red-brick flats. What the newspaper account didn’t mention was that almost exactly a year previously, on the 14th February 1915, William’s younger brother Charles, also serving in the East Surrey Regiment, was killed in France. The combination of that, the flight of his wife and the thought of returning to a bloodbath in France with the Somme looming on the horizon was simply too much for William Norris to take. Further insight on William Frederick Norris and his background has been provided through research done by Chris Burge in October 2015. Fascinatingly, it appears his army connections ran deep. His father, William Henry Norris had served in the Army Service Corps between 1874 and 1886. He was in Africa during the Zulu war of 1879, in Egypt and the Sudan 1884-1885 and as part of the Nile Expedition. Think Rorke’s Drift, Isandlwana and General Gordon – he might even have come across George Nathaniel Daniell. William had taken some time out from soldiering to marry Alice Elizabeth Moore on Christmas Day 1876 at Cheriton, Kent. William Frederick Norris and his sister Alice were born in nearby Shorncliffe. Their other children were Charles, Lucy, Arthur and Alice. He died aged 44 in 1896 when William was sixteen. 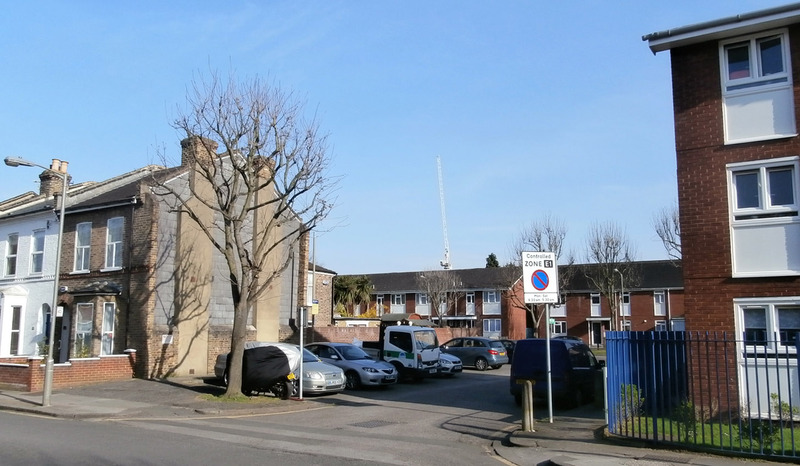 Alice moved around after her husband’s death, and in about 1899 both Charles and Lucy started attending Fircroft Road school, when Alice was living in St. Cyprian’s Street Tooting, very close to the market. They also lived in Letchworth Street. In the 1901 census two of Alice’s children, Arthur and Alice, are described as ‘cripple’. Life must have been extremely hard. At some stage she moved to 47 Summerstown and was there until her death on Christmas Day, 1932. She is buried in Streatham Cemetery. Two of her younger children, Alfred Edward Norris and Lucy Jane Norris had both married by 1914 and their families lived in Merton for many years. Lucy became a Mrs Bavin and was still in Merton when she died in 1972. She had four sons, so there is a fair chance that descendants of the Norris family may be around. Soon after the death of his father, William Frederick Norris became a part-time soldier in the East Surrey Militia from October 1897 to August 1899. He gave his address as 9 Skelbrook Street in Earlsfield. The record above shows proof of his medal award for service in the Second Boer War as part of the 2nd Battalion of the East Surrey Regiment. This was the ‘ribbon’ that the witness in The Fountain noticed him wearing on the evening that he died. His younger brother Charles had joined the army in 1908 and saw service in India and Burma. With war on the horizon, the 3rd Battalion of the East Surrey Regiment, acting as a reserve for the 1st & 2nd would have been at Dover, training raw recruits, and assembling army reservists like William Norris. His medal index card shows he was sent to France on 11th Sep 1914 as part of a large draft of men. Here he joined the 1st battalion, arriving at the front on 24th September 1914. At this point, from notes in the St Mary’s parish magazine, we probably know more about about James Jenner Crozier than any of the other Summerstown 182. Read his story by downloading the document on the Sunday School Three page. It contains an extremely moving account from a letter sent to Reverend Robinson from the soldier comrade who witnessed his final moments. He started up the St Mary’s football team, he took photographs, he taught in the Sunday School. In the words of Reverend Robinson, ‘He had a great influence for good on all who knew him’. He mentioned how he was looking forward to James returning from the war ‘with new experiences and a fresh outlook on life, as one who would be of the greatest help in the work of the parish’. Small wonder that a special memorial tablet was commissioned bearing his name and that of two other teachers killed in the war, William Mace and Laurence Gibson. And surely no surprise that we would like to raise money to have this tablet restored. James Crozier was killed on 1st October 1915 in one of the fiercest battles of the early war years, one of 59,000 British casualties at Loos, where his name is inscribed on the memorial. According to the 1911 census records, James was the eldest of five brothers and one sister. The family were living at 37 Smallwood Road. The original house that the Croziers lived in has now been demolished and a block of houses have been set back in a 198os-style close. On the left of the above photograph, the last original house on the left is No 27. Six other men from Smallwood Road were killed in the war and have their names inscribed on the St Mary’s memorial. Records indicate that two of the Crozier brothers, Arthur and Ernest served in the Royal Field Artillery and survived the war. It would be wonderful to get in touch with their descendants and find out more. Whilst many of the homes of the Summerstown 182 still exist, others have completely disappeared, literally swallowed up by new development and modern progress. If you head down Pevensey Road towards Tooting today, you walk straight into the monolithic St George’s Hospital. In 1914 this road ran straight into another road called Tooting Grove and dissected a vast site which was home to two hospitals, The Fountain and The Grove. James and Emily Wilson lived at 48 Tooting Grove. Their son James, a soldier of the East Surrey Regiment was killed on 24th March 1915. If you were heading up Tooting Grove towards Summerstown, The Fountain Hospital would have been on the right and The Grove on the left. As part of the establishment of the National Health Service after the Second World War, St George’s Hospital Medical School moved from Hyde Park Corner and took over the two old run-down hospitals. In 1973 building began on a huge new hospital complex which swallowed up the top part of Tooting Grove. The bottom bit still exists but the houses were rebuilt in the thirties. You can still follow the course of the road by entering the Medical School via Cranmer Terrace, and by my reckoning, James Wilson’s old home is somewhere in the Lanesborough maternity wing. The Grove Fever Hospital opened in 1899 specialising in the treatment of infectious diseases. During the First World War it was requisitioned by the War Office and in 1916 became the Grove Military Hospital with 550 beds. Before closing in September 1919 it had treated 2,499 officers and 13,459 enlisted men. A number of the Summerstown 182 buried in the adjacent cemeteries very likely passed through. On the other side of Tooting Grove was The Fountain, also originally a fever hospital. At the turn of the century, a vicar’s daughter from Norwich called Edith Cavell trained as a nurse there. She later worked in Belgium and was notoriously executed on October 12th 1915. Her statue stands just to the north of Trafalgar Square opposite the National Portrait Gallery. In 1912 the Fountain became a centre for the treatment of mentally ill children. 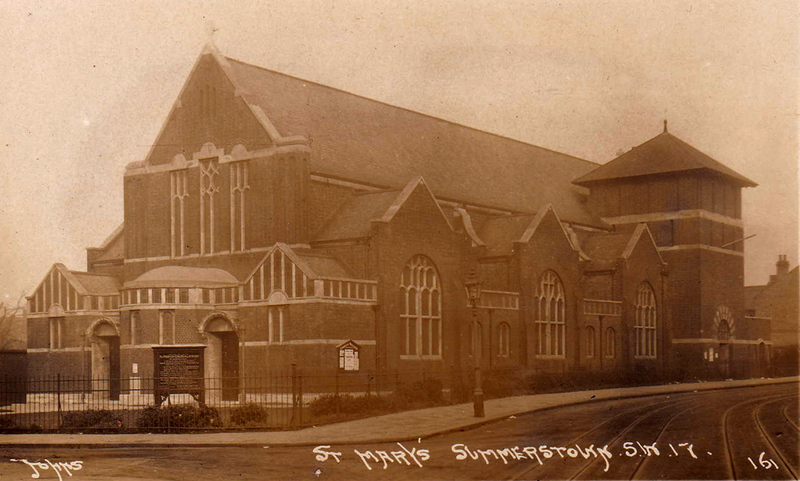 In 1959 it relocated to St Mary’s in Carshalton and the building was demolished in 1963. A support group called the Friends of the Fountain Hospital developed into the National Society for Mentally Handicapped Children and today is known as Mencap. UPDATE We visited James Wilson at Dickesbusch in the summer of 2016. We still know very little about him but the message from Emily on his headstone is very touching ‘In Thoughts Always, Mother’. He joined the 2nd Battalion of the East Surrey Regiment in Kingston with the very distinctive service number of 27 and arrived in France on 9th February 1915. He died just over a month later on 24th March in the trenches about five miles south of Ypres. The war diary shows that he survived the ferocious fighting at Spanbroek Molen on 12th in which 40 of his battalion were killed. On 22nd at Locre a hand grenade exploded in practice killing one man and injuring 12. The following day the battalion moved to Dickebusch. The diary of the 24th recounts ‘arrived at Dickebusch 745pm. 300 men proceeded as working party, 1 man killed, 1 wounded’. The first member of the local 13th Wandsworth Battalion to be killed in the First World War came from Tooting Grove. James Norris, aged 34 lived at 6 Alfred Cottages, Tooting Grove. He was struck by a shell on 18th June 1916 and his name is on the Loos Memorial. Another person with a very big connection to the road is no lesser man than Corporal Ted Foster VC, born at No14 in 1886. This weekend, Karen and Thomas from Lüneburg in northern Germany have very kindly made a special trip to Hamburg Ohlsdorf Cemetery to take a photo of the grave of Private William Warman, the stretcher-bearer from Alston Road. (see the post ‘Distinguished Conduct’ in the December archive) From what we know to date, he is the only one of the Summerstown 182 whose final resting place is in Germany. Ohlsdorf is enormous, the largest non-military cemetery in the world. During the First World War, it was used for the burial of over 300 Allied servicemen who like William Warman, died as prisoners of war. 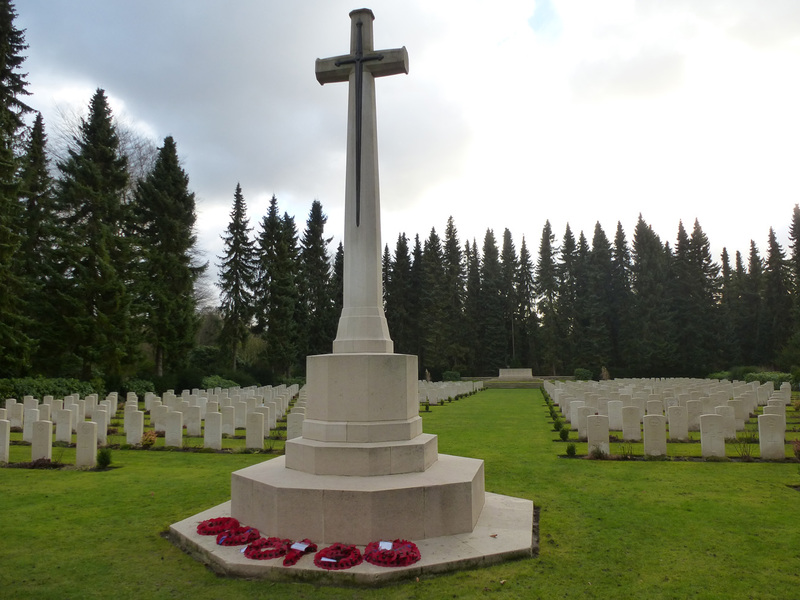 In 1923 it was decided that the graves of Commonwealth servicemen who had died all over Germany should be gathered together in four permanent cemeteries. Hamburg was one of those chosen, and burials were brought into the cemetery from 120 other burial grounds. The majority died as prisoners, but a few were sailors whose bodies were washed ashore. There are now 708 First World War servicemen buried or commemorated there. Karen told me that the day they visited was the only day with blue sky and sun in a week of rainy grey days. Sidney Howard Marshall, a soldier in the Canadian Infantry, died on 24th April 1915. He is one of 54,000 names on the famous Menin Gate Memorial in Ypres. So far he is the only one of the Summerstown 182 to have lived in one of the almshouses that cover a vast six acre section on the corner of Garratt Lane and Wimbledon Road. He resided with his Mother, Sarah Annie Marshall at No 8, Holborn Estate. This curious collection of ornate red-brick buildings, complete with landscaped gardens, pergolas, holly hedge, mature fruit trees and a chapel is like a walled country estate, nestling incongruously between the Hazelhurst Estate and Streatham Cemetery. Officially known as St Clement Dane’s Almhouses and also Diprose Lodge, the development was provided by the Church of St Clement Dane’s on The Strand in central London. In order to spread some of their great wealth around, they set up The Holborn Estate Charity in 1552, initially to distribute alms to the poor. Schools and houses followed. They even supposedly gave out oranges and lemons to children – think of those bells and the famous rhyme. In 1848 they purchased farmland in a pre-industrial green and verdant corner of south-west London called Summerstown. Beautiful new homes for the deserving elderly and orphans of the parish. The Queen Mother even visited in 1952 to unveil a plaque. One hundred and sixty years later, whilst all around them has changed, the almshouses survive in almost all their glory. There are about 40 homes, a gate lodge, the gardens – and whilst the chapel is still existant (if not exactly functioning), an ornate fountain has disappeared. They have been in the hands of the Council since 1967 and are a mix of privately-owned properties and council homes. The almshouses back onto a small strip of convenience stores and the Tasty Chicken take-away on Wimbledon Road. The sight of discarded fastfood wrappers and urban detritus makes for an interesting contrast to the gentle pastoral scene of pears and apples hanging off the trees at the back of Diprose Lodge. Maybe not quite oranges and lemons, but near enough. Britain declared War on Germany on 4th August 1914 and just over ten weeks later, the first parish casualty was the beautifully-named Victor Le Strange Wayre. Reverend John Robinson wrote him a short obituary in the St Mary’s Church parish magazine, but such were the subsequent losses over the next four years that he was unable to do this for any of the other Summerstown 182. Victor was 18 and in the Army Pay Corps and he never even made it out of the country. He very likely either got sick or was injured in a training accident, but he died in hospital in Warwick on 22nd October 1914. He is one of 26 First World War casualties who rest in Warwick Cemetery. His widowed mother Laura lived at 2 Freshford Street. In the obituary, the vicar fondly remembers him, ‘For many years a member of our Choir, as leading boy and lately an alto, whose beautiful voice was so greatly appreciated by the congregation. He was a favourite with all who knew him’. Victor would certainly have known and probably grown up with a lot of the people in the above photograph from 1924. Among them are four brothers of Charles Jeffries from Thurso Street, another of the Summerstown182. Exploring the less well-visited parts of St Mary’s Church, I’ve been fascinated to study the wooden casing enclosing the organ mechanism in the church tower. Initials have been scratched on there over the years, I imagine by restless choirboys. Many of them were carved over one hundred years ago and although I’ve looked hard, I can’t find Victor or any other names I recognise. There are creaking cupboards up there containing great dusty wads of sheet music and there can be no doubt that he would have sung from some of those. Sadly the choirboys have all gone but their legacy lives on in ‘Betty Holloway’s wardrobe’ where apparently they used to hang their surplices. It was round Easter 2015 when we dropped into Warwick Cemetery on the way home from Wales to visit him. His grave is curiously quite isolated, in a quiet section of the cemetery with a nice backdrop of conifers keeping an eye on him. The personal inscription at the foot of the headstone simply reads ‘Rock of Ages’. Perhaps one of his favourite hymns. As the photo suggests we weren’t the only recent visitors he has had. Not too far away is the grave of Enoch Powell, flanked by those of a number of his Warwickshire Regiment comrades. The great majority of the Summerstown182 were killed in France and Belgium. However, there were many other corners of the globe touched by the First World War where local men fell, amongst them such places as Jerusalem, Gaza, Egypt, Greece and Turkey. The furthest away from home, died and is buried in northern India. Reginald Edward Knight, who lived with his wife Annie and four children at 17 Squarey Street, served in the Royal Field Artillery and passed away in a hospital on 4th June 1918. He is buried in Ferozepore (Firozpur/Ferozepur) Military Cemetery in the Punjab. About fifty miles south of Lahore and very close to the India-Pakistan border, this was the site of the first Anglo-Sikh War of 1845 and subsequently a strategic British Army base. Known as the ‘Land of Martyrs’, not far from the border is The National Martyrs Memorial at Hussainiwala, in memory of Bhagat Singh, Sukhdev and Rajguru, three men who fought for independence. Every year, on 23 March, the Shaheedi Mela is observed at the memorial and the day is observed across the state of Punjab. Squarey Street is one of the most tranquil and peaceful streets in Summerstown, tucked away from the bustle of Garratt Lane on the bend close to the Wimbledon Road roundabout. The houses which date from the 1880s are still intact and N017 has a front wall topped with a delightful border of violets. Its hard to believe that someone from here lies so far away, albeit in what is probably a stunning location, almost within touching distance of the Himalayas. What was he doing there? Well, for a start, at that time a lot of the world map was coloured pink and like a fifth of the world’s population, India was part of the British Empire, the so-called ‘Jewel in the Crown’. 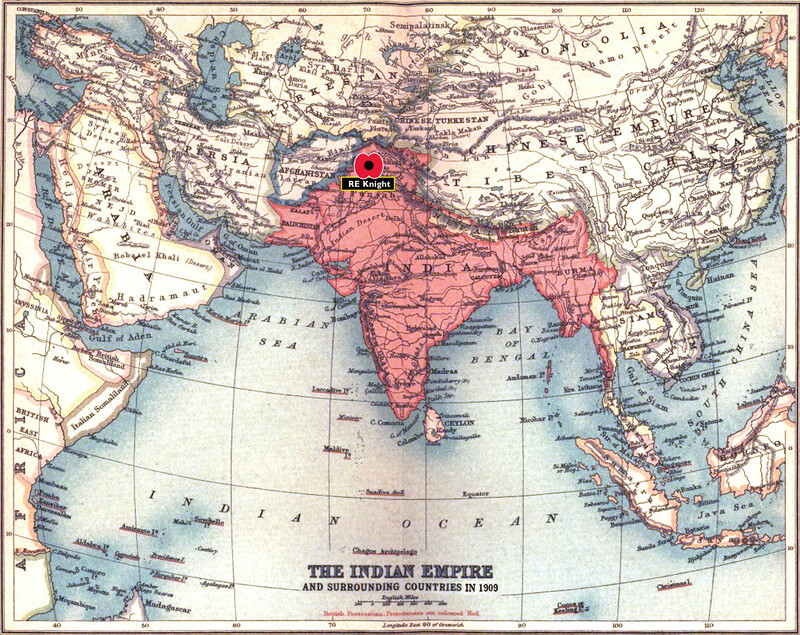 In 1914 India would have seemed quite vulnerable to some form of uprising or attack, hence the need for a British military presence there, particularly in the north-west frontier. Many of those sent out would on the whole tend to be older men and Reginald Knight was 36. His Commonwealth War Graves Commission record lists him as a driver. Many of the casualties in such outposts were as likely to die from a disease like malaria or sunstroke as from a bullet. As Reg went one way, it is estimated that a million and a half soldiers and non-combatants travelled in the other direction to support Britain in the First World War. Many of these men were simply happy to be mobilised to go to Europe and help out ‘the motherland’. Others believed their show of support would surely lead to self-rule. Why, the King of England had even laid on one of his grand palaces as a hospital. They came from all corners of ‘undivided India’, (comprising present-day India, Pakistan, Bangladesh, Burma and Sri Lanka) but particularly the north. 82,000 of them are estimated to have died. Mahatma Gandhi, who for a while lived just up the road in Fulham even encouraged recruitment. Unfortunately hopes of independence were mistaken and if anything the grip tightened. Not far from Reg Knight’s resting place, in April 1919, the notorious Jallianwala Bagh Massacre at Amritsar by troops under Brigadier-General Dyer, resulted in the deaths of possibly up to one thousand people. This provided the catalyst for Gandhi’s movement of peaceful resistance. They had to wait until 1947 and another World War before that could be achieved. Reg was born in Eastbourne in July 1881, the third oldest son of Richard Edward Knight, a carpenter and joiner and his wife Elizabeth. Records suggest that there was quite a bit of movement for the family around the south London area over the next decades. He was baptised on 7th February 1886 at Holy Trinity in Croydon. A school admission record from 1889 indicates that they were in Battersea and young Reg was attending Plough Road School, now High View. They lived at 137 Speke Road on the northern side of Clapham Junction railway station, an area now covered by the Winstanley estate. By 1891 the family were back in Croydon and there were six children, four boys and two girls. 1901 was a big year for Reg, now twenty and working as a carman. Adventure beckoned and on 8th March he signed up to the 3rd Battalion, The Queen’s (Royal West Surrey Regiment). On the census night he was in Stoughton Barracks near Guildford. Did this military interlude take him all the way to South Africa and the Second Boer War? We can’t be sure, but the timing would have been right and this regiment did participate, returning to this country in May 1902. He joined so soon after the death of Queen Victoria that her name is still on the attestation form and is inked out with ‘Edward VII’ scribbled in its place. The rest of the family were still in Croydon at 8 Burdett Road and another sister Emily had been born in 1893. The other siblings were all still at home, eldest son Richard was a milkman’s assistant, George a tram conductor, Katherine a waitress in a cafe and 13 year old William a grocer’s assistant. Whatever happened over the next few years, Reg was back in London in 1906 and got married to Annie Linch. In 1911 they were at 13 Lydden Road, Wandsworth with two small children. Emily aged four and one year old Ernest. A second son George was born on 6th April 1916 and Ethel arrived the following year. Ernest lived to be ninety, passing away in Hillingdon in 2000. George died in Dunstable in 1994. Now 30, Reginald worked as a coke carman. He might have picked up much of his coke from the giant Wandsworth Gas Company which dominated the area next to the river. They even had their own collier, the SS Wandle carrying coal from Newcastle. Reg would have shared in the general jubilation when she sank a U-Boat in 1916. Lydden Road was part of the industrial heart of Wandsworth, in an enclave of streets off Garratt Lane, famous for their associations with horse-trading, a romany presence and a variety of less-than-pleasant factories and industries. Just a few doors away at No8 were the Grandparents of the illustrator Raymond Briggs. Dad James was working at a ‘phonographic factory’ which can only be Columbia Records, which was established in nearby Bendon Valley in 1905. His eldest son had the delightful job of being a ‘fat melter’ in a bone factory, another son was a smith’s mate in an iron works. The bone factory was almost certainly an off-shoot of the notorious Harrison and Barber horse-slaughtering yard. Another son, then ten years old would become a milkman. This was Ernest Redvers Briggs, so delightfully portrayed this Christmas in the brilliant animated adaption of ‘Ethel and Ernest’, Raymond Briggs’ affectionate homage to his parents. In one of the scenes, where Ernest steps out of the front door onto his bike, one of the coal carts outside his door may well have been that of Reg Knight. This was a rough, tough world, Ernest wasn’t too keen to bring Ethel round when they were courting and Reg would have been keen to move his young family to more genteel surroundings. Ethel and Ernest found their dream home just across the Wandle in Ashen Grove, Southfields. In 1914 Reg and Annie Knight moved three quarters of a mile down Garratt Lane and relocated to 17 Squarey Street in Summerstown, an address that the family would be associated with for nearly six decades. Settled into their little terraced house near Garratt Green, with Asletts’ sweet shop round the corner, the world must have been full of promise for Reg, Annie and their young family. It was soon to be turned upside down. Its doubtful if the father of a young family would have rushed to join up again, but as an ex-soldier, Reginald may have felt it was his duty. In any case, he became a driver in the Royal Field Artillery. His work hauling coke around and background in the horse-dominated world of Lydden Road would have stood him in good stead for what was to come. A typical 18-pounder field gun would have required six horses to pull it, with two drivers allocated to each horse. There wouldn’t have been a demand for such things in the Khyber Pass but Reginald was at some stage posted to the north-west frontier of India. He died of illness on 4th June 1918, leaving Annie back in Summerstown with four children under ten years old. The Knight family’s connection with 17 Squarey Street would continue for many years. In the 1939 Register, Ethel and George would appear to still be living there with Annie. George Bertram Knight, now 23 was a dustman and most certainly known to ‘Tiny Ted’ Foster, the Victoria Cross holder from Fountain Road. Ethel worked in a laundry, of which there were plenty nearby. 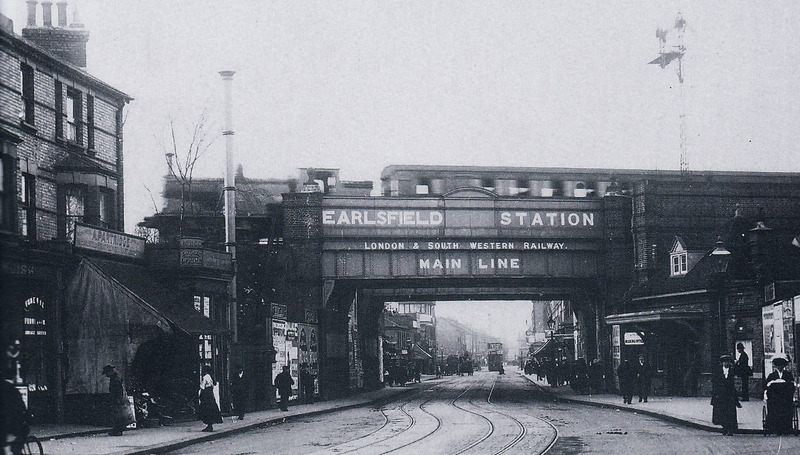 Ernest was at Squarey Street until at least 1935. George Knight married Joan Gould in 1945. They had three children, the eldest of whom Colin, was born in 1947. Annie died in 1969 aged 85, possibly the last surviving widow of any of the Summerstown182 and still living in their marital home at 17 Squarey Street. Ethel who was living with her at the time and aged 52 may have resided there for some while longer. Meanwhile Reginald lies in Ferozepore Military Cemetery, in the Punjab, one of 88 casualties, looked after by some of the gentlemen in the above photograph which was posted not too long ago on the Commonwealth War Graves Commission twitter feed. His records indicate that he was the husband of Annie in Squarey Street and the son of Richard and Elizabeth Knight from Croydon. Richard had in fact passed away the previous year. To help us learn more about this and the involvement of Caribbean soldiers, the Friends of Summerstown182 will be visiting the graves of West Indian soldiers in Seaford and the Memorial Chattri on Patcham Downs. We also intend to visit The Royal Pavilion in Brighton and see the recently unveiled blue plaque to Subedar Mir Dast, who was awarded the Victoria Cross for his bravery at the Second Battle of Ypres. A pathan, from a village in the Maidan Valley in the Khyber Pass region on the north-west frontier, perhaps not far from where Reginald was posted. Mir Dast and his regiment, the 57th Wildes attacked with the Ferozepore Brigade on the afternoon of 26th April 1915. In the face of a devastating gas attack and although badly wounded himself, he saved the lives of eight injured officers. Mir Dast eventually returned to India but many did not. One way we would like to engage interest is to tell the story of one of these men, someone like Reginald Knight who died a long way from his home. Perhaps someone from Firozpur, in the Punjab. If anyone can help us to do this, please get in touch.